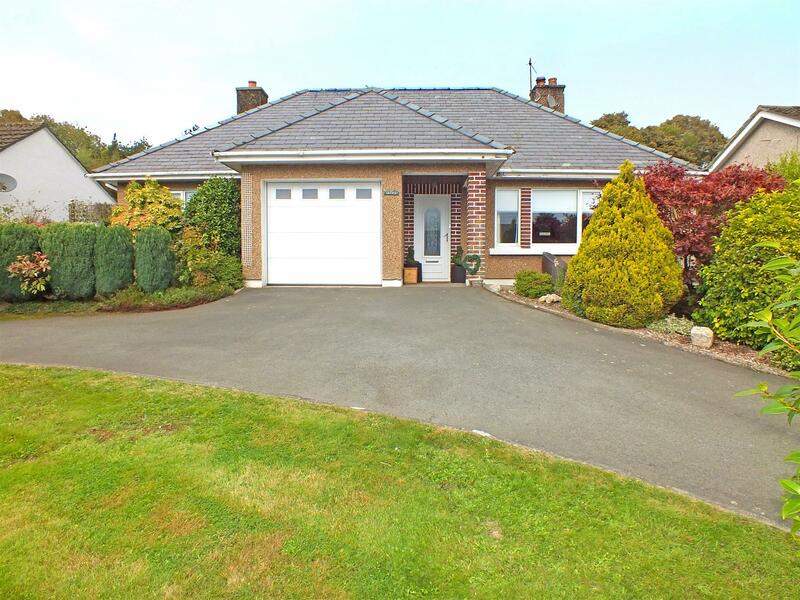 An Attractive Detached Bungalow in the Sought After Village of St Johns. Walking Distance to Local Shop, School & Arboretum. On the Main Bus Route. Slightly Elevated with Views Toward Slieau Whallian Hill. Spacious, Dual Aspect Lounge & Breakfast Kitchen with Walk in Pantry. 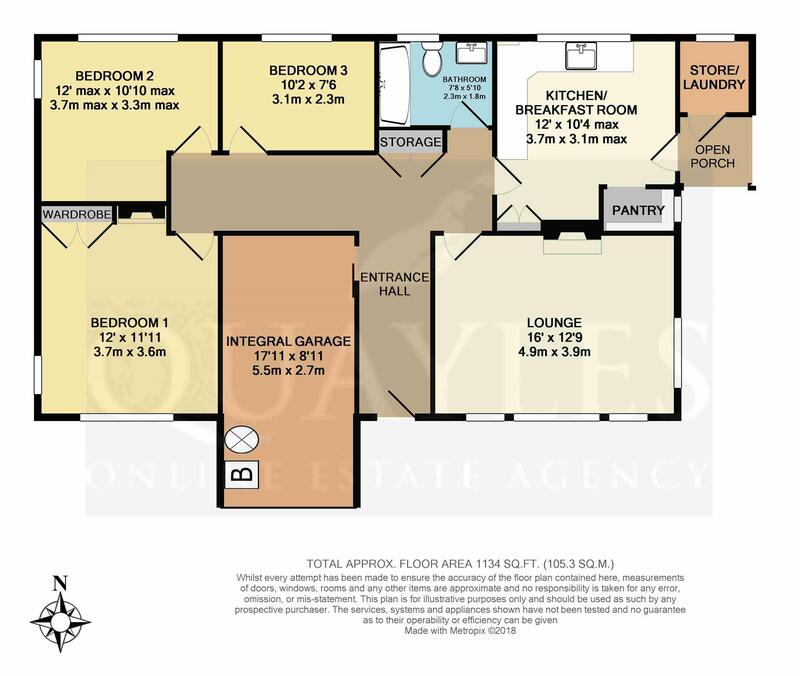 Three Bedrooms (2 Doubles and 1 Small Double/ Generous Single). Modern Bathroom with 3 Piece Suite & Shower Over the Bath. Integral Garage with Electric Up and Over Door. Large Driveway/ Turning Area . Well Stocked, Mature Lawned Front and Rear Gardens. Attached Store/ Laundry. A Pathway to the Right Side Leads up to a Neighbours Bungalow. Travelling in from Douglas along the TT Course, proceed over the traffic lights at Ballacraine. Pass the old Smithy on the right. Arfryn is the second bungalow on the right hand side. A decorative uPVC door opens into the entrance hall. A spacious 'T' shaped hall with a coved ceiling. Built in cloaks cupboard with fitted coat hooks. Doors to all rooms and the integral garage. Wood effect floor covering. Recessed downlights on dimmer controls. Power point. Access to the spacious loft that has planning approval for a full conversion. Fitted with a range of hand painted base and drawer units together with laminate work surfaces and a ceramic 'Belfast' sink. Fitted shelving to two walls. Plumbing and space for a dishwasher. Space for an electric cooker. Recessed downlights. Large uPVC window to the rear elevation. Half obscure glazed uPVC door to the side of the property. Built in shelved cupboard. Walk in larder cupboard with an obscure glazed timber framed window. Easy care, vinyl floor covering. A naturally bright, dual aspect room with uPVC windows to the front and side elevations. Pleasant views to the hills from the front elevation. Recessed glass fronted wood burning stove with a slate surround and hearth together with a solid wood mantle. Coved ceiling with centre rose and picture rail. Oak effect floor covering. Television and satellite points. Telephone point. A fully tiled room fitted with a modern white suite comprising panelled bath with centre taps, fully plumbed shower and glass folding screen fitted, WC and a large vanity unit with an inset basin with an illuminated and shelved mirror above. Chrome ladder style towel warmer/ radiator. Obscure glazed uPVC window to the rear elevation. Recessed downlights and 'Addvent' extractor. Tiled floor. A large single/ small double room with a uPVC window to the rear elevation. Shelves to one wall. A dual aspect L shaped double room with uPVC windows to the side and rear elevations. A dual aspect room with uPVC windows to the front and side providing views across to Slieau Whallian Hill. Original decorative tiled fireplace. Recessed built in wardrobe to one corner. Having an electric up and over panelled door to the front and a timber framed window to the side elevation. 'Warmflow' oil fired boiler and 'Tempest' pressurised hot water cylinder. A basic external structure located just beside the kitchen with a covered walkway between. Plumbed for a washing machine with space for a dryer above. Timber framed window to the rear elevation. The property is approached via a tarmac driveway which provides off street parking for numerous vehicles and leads to the integral garage. There are well stocked, mature shrub beds and a lawn together with a small south facing patio area which makes the most of the views and enjoys much privacy thanks to the front boundary hedge. PLEASE NOTE: A block paved path leads along the side of Arfryn to the rear garden continuing on to the property behind. Although pedestrian access must be granted to the neighbours the pathway belongs to Arfryn. Mainly laid to lawn with a large well stocked sloping flower bed. Hedges, shrubs and low brick wall to the side boundaries. The rear boundary extends to the low wall in front of the neighbouring bungalow. All mains services are installed. Oil fired central heating & primarily double glazed in uPVC. Freehold. A block paved pathway to the right side of the drive gives pedestrian access only to the bungalow located behind and above Arfryn.